GSMArena team, 27 June 2013. 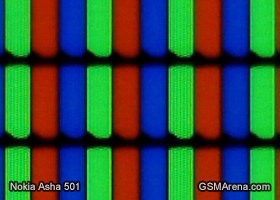 The display on the Nokia Asha 501 is a 3" TFT unit of QVGA (240 x 320) resolution, which boils down to around 133ppi. The screen is capacitive and has multi-touch support. Colors are nice and punchy and the screen is reasonably bright. Size may be an issue, as well as resolution, but the responsiveness has been notably improved from what we remember with the older Asha phones. Browsing the web and watching videos isn't the most compelling experience on a screen of that screen size and resolution of course. And here go the stats - contrast levels are pretty good but the brightness isn't all that impressive on paper. Blacks are good too. The pixel arrangement is standard RGB. You can find all about our display testing routines here. The Nokia Asha 501 features a power button on the right side, which will also lock and unlock the device, although you can do without it as the phone can be nudged out of standby with a double tap on the screen. The volume rocker sits comfortably in the upper right corner of the phone. All three buttons (power and volume) are solid to press and easy to locate by touch. The left side of the Nokia Asha 501 doesn't hold any controls. At the top there's the microUSB port, along with an old-gen Nokia charging port and a 3.5 mm headphones jack. The bottom holds no controls whatsoever. Undoing the back cover is easy - a light push on the nub at the bottom will do and the phone's bottom part will pop out of the shell. You can then go on and take the phone out. Doing so reveals the 1200 mAh Li-Ion battery, with the primary SIM card slot under it in the very battery compartment. The hot-swappable microSD and secondary SIM card slot are on the side. This actually means they could've been accessible on the outside too but Nokia went for exchangeable covers instead. The battery on the Asha 501 is quoted at 624 hours of stand-by and 17 hours of calls for the dual-SIM version and almost double the standby time for the single-SIM variant. We had the Nokia Asha 501 sitting around for a couple of days before we started actually testing it - making calls on both SIM cards, taking pictures, browsing the web, listening to music and checking out most of the available options and apps - and we managed to get the battery down to about 30%.